Hydralada Company specialises in supplying equipment to increase output and improve efficiency on the orchard. 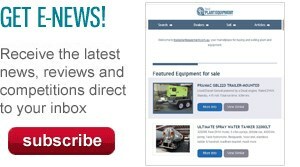 The platform machines are designed to be operated all year round, and with a full range of pruning attachments. 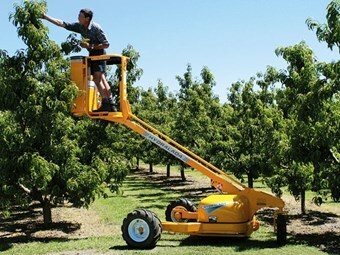 A Hydralada self-propelled elevating work platform has the capacity to increase productivity by up to 200 percent. One person pruning from a Hydralada platform can out-perform three people on conventional step ladders and the safety aspect is significantly improved. There is a full range of pruning tools available including both hydraulic and battery power. The Hydraloppa is renowned for its powerful cutting capacity and reliability offering a long trouble-free service life. Hydraulic chainsaws are also available and are powered from the Hydralada machine. Hydralada's Pellenc range of lithium-ion battery-powered tools are outstanding in performance. They are designed for commercial use and the battery delivers power to operate the tools for a full day, plus some, depending on the particular application. Pruners with 40mm cutting capacity and chainsaws with amazing power are designed to reduce fatigue associated with dormant winter pruning. Operating costs are extremely low and the battery power source eliminates noise and fume pollution.